At Claires Court children in our Nursery are entitled to 15 free hours per week, (3 hours per morning session), however this does not apply until the term after the child turns three. Pupils can join the nursery in the term in which they turn three but there is no free entitlement. Fees are based on children attending the same set of morning, lunch or afternoon sessions each week throughout the term. Any additional sessions will be charged as a Casual Session. Children in Nursery Classes must attend a minimum of two morning sessions per week; those in Transition Class attend five morning sessions per week. If your child is then attending an afternoon session on the same day, a lunchtime session will automatically be allocated. The sections below explain how how our fees are calculated, your termly costs and how we apply 15 free hours per week. Working out your costs can be quite complex so just email or call us (01628 327712) and we can help you calculate the fees for your child's nursery education. This offer is for parents requiring full care, five days per week (07:30 to 18:30). The package includes both Extended Day elements, a Full Day and breakfast, hot lunch and tea. It applies only to those eligible for free hours and for five full days, booked in advance termly. Our charges on a daily/sessional basis are as below. * Fees relate to those hours over and above the three free hours available per day. ** Transition requires attendance five mornings per week. Fees are invoiced and payable by Direct Debit on the second Monday of each half term unless already paid by Childcare Vouchers. A charge of £30.00 will be levied for failed Direct Debit payments. Children in the Nursery settings (3 year olds) must attend for a minimum of two morning sessions per week. Additional morning and/or lunch and afternoon sessions can be booked separately, subject to availability. Children in the Transition setting (4 year olds) must attend five mornings per week, offering academic continuity and development in the pupils' learning. Additional lunch and/or afternoon sessions can be booked, subject to availability. During lunchtime sessions children are supervised while eating a hot lunch prepared on site or a packed lunch from home and then take a rest afterwards. For the hot lunch there is a charge of £2.90 in addition to the lunchtime session charge. In the afternoon there is a varied and stimulating activity programme for children. Activities may include Pre-Ballet Movement, Malleable Materials, French, Music, Imaginative Play and Physical Development. Those children who regularly attend on the afternoon of the activity are invited to join in without further charge. Some activities are strictly limited as to the number of participants. 'Breakfast Club and After School Care' can be booked separately offering an extended day from 07.30 until 18.30. These sessions include breakfast (between 07:00 and 08:00) and a light tea (at 16:00). Claires Court also runs Holiday Activities outside of term time. Please discuss your requirements with the School Office. All children must wear the official School burgundy sweatshirt and grey T-shirt. Purchased from our uniform supplier - Goyals, Bridge Street, Maidenhead (01628 639725). Our setting has been accepted by the Royal Borough of Windsor and Maidenhead (RBWM) as an appropriate provider of Early Years Education and pupils on roll are eligible to receive a free entitlement under the Nursery Education Funding scheme (NEF). Currently all qualifying three and four year olds are entitled to 570 hours of free nursery education per year. We offer three hours free within each of our morning sessions up to a total of 15 hours weekly and eligible children can make up the difference (to a maximum of 30 hours in any week) with another provider. To qualify for the free entitlement, it is only necessary to provide proof of age (e.g. a birth certificate) and a signed Parental Declaration form (available from the School Office). Subject to availability, the Nursery has a small number of places available from 12:30pm to 3:30pm daily during term time. These are offered on a no-registration fee basis (for entry at 3+ years) but, for reasons of equality and fairness, it is necessary to operate a waiting list system. Please apply as soon as possible to the Head of the Nursery in writing if you wish to place your child’s name on this waiting list. Please note that these sessions are not open to those attending morning sessions and that uniform is required (see below). The Registration Fee of £100 is payable immediately if other sessions are taken e.g. casual, pro rata and out-of-school care sessions. The qualifying birthdates indicated in the fee table are those provided by the RBWM and are based on the current funding obligations of the local authority. These may change in the future and the dates are to be used as a guide only. The School will accept Childcare vouchers in payment of Nursery Fees under HMRC rules or will invoice parents’ employers direct. The School’s contract, however, remains with the Parents, who will be liable for settlement of fees in the event that Childcare Vouchers or employer invoices are unpaid for any reason. HMRC has now launched the new Tax-Free Childcare online payment account and the School has signed up to be able to receive payments from these accounts. Children who attend all day for five days per week and are the younger brothers or sisters of pupils on roll full-time at Claires Court are entitled to a sibling discount of £300 per term. 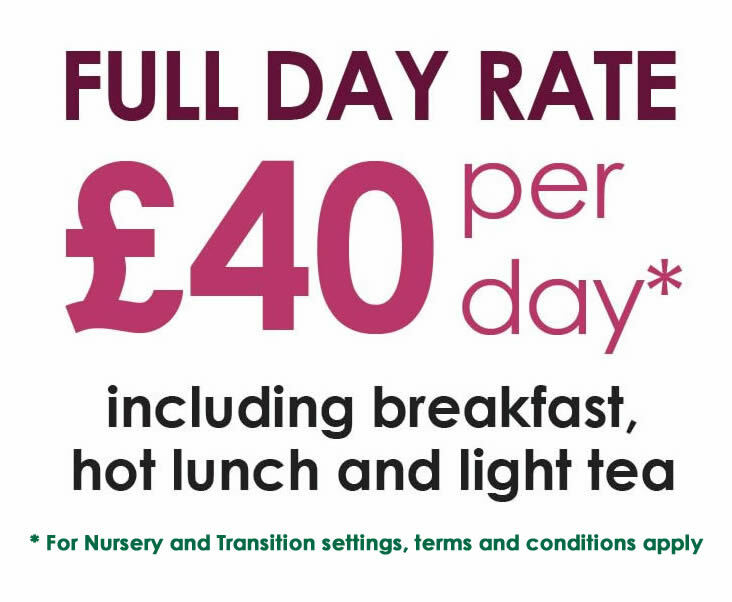 This discount does not apply in conjunction with the Full Time Nursery Package offer (see below). Insurance cover against personal injury and dental accident is included. Please note that cover does not extend to medical expenses. Our fees refund scheme does not cover Nursery Fees. A £100 Registration Fee is payable with your application form. This is non-refundable once an offer is confirmed in writing by the School. A deposit is not required although one is required on transfer to a Claires Court Reception Class. A half term's notice, in writing to the Head, is required for the withdrawal of a pupil from the Nursery, otherwise a half term's fees will be payable in lieu of such notice. Please call us to talk through your options and discuss availability of sessions. We recognise that working out your costs can be quite complex so just email or call us (01628 327722) for further assistance.